Miriam’s swirling silverware is influenced by the movement of the sea. It is the movement of flowing water that inspires Miriam to create her shimmering, beautiful silver tableware. Miriam's hand sketches and photographs documenting the coastline of Suffolk are scattered around her workspace; these images are transferred to the silver to create the silver’s form and design using techniques of chasing, repousse and forming on wood. 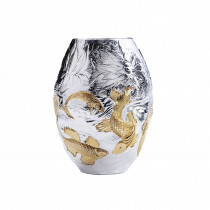 The resulting pieces are functional and are also exquisite sculptural pieces. Miriam graduated from the University College of Creative Arts with a BA Hons in 3D Design for Metalwork and Jewellery. She has exhibited widely, including at the Saatchi Gallery and at the V&A. Miriam was commissioned by the Drapers' Company to create a silver badge for a hunting stick which was gifted to the Queen for the Diamond Jubilee. Working on creative visual projects has always been an area I can work away to my hearts content in, without getting bored, or nervous of it. I nearly took the music route when I was choosing my career, but the only thing which put me off was the nervousness I got before performances. In art, I don't get nervous although I work with precious metals. Flowing movement, intricate detail, which often comes from natural sources such as water, rocks, plants, mosses, fish, birds, or just an abstract section of wood bark for instance. Finishing the silver piece - polishing up the edges, or ridges, shining the piece up with a brass brush or silver cloth, bringing to life all the hard work that has been done before. To not be too regimental about it, 'play as you work, work as you play'. And in terms of choosing materials? Most often the material I use is silver, but the character, nature or texture of the silver has to be harmonious with the idea of the piece. For example, delicate Iris petals have a matt, almost luminescent quality, therefore I would not choose a shiny surface for a piece inspired by Irises, but a velvety, soft texture. Often the texture comes to mind first, way before the idea of an Iris. Can you describe from beginning to end how a piece, selected by you, is made? I am currently making a set of four tumblers inspired by 'aromas'. After dabbling with aromatherapy, I found certain oils which were so invigorating, and wanted to see if they had the same effect visually in silver, using drawings of the plants or trees. I looked at Eucalyptus leaves and their mottled, but smooth texture. I saw what a contrast the red buds were to the leaves. Then I made up a chasing tool especially for that texture, and chose a lemon gold colour for the gilding on the buds. For me the satisfaction of recreating the subtleties of the leaves and buds in the chased tumbler produced an enigmatic quality like the essential oil. The chasing and engraving techniques, and adopting new approaches to these traditional techniques in my work. Without putting too many words to it, hopefully the vibration or feel of my style comes through the pieces to their viewers. The commission for HM The Queen for her Diamond Jubilee in 2012. Although it was small, it was an exciting commission of a silver engraved band for a hand-carved walking stick. It had birds in flight and grasses around the lettering. If I were to own a piece for myself, it would probably be a Whirlpool Bowl. There is something satisfying about the spiral which swirls around the centre, and comes to a point from the big whirls. It is totally up to me and the depths of my mind to create whatever is important for me at that moment. Not having to be confined by rules and regulations, and being allowed to take twists and turns in my inspiration without having to justify it to anybody! Having to plan my own timetable! Malcolm Appleby- has taught me a great deal, whether knowing that he has taught me, or not! Usually clients see an aspect of my work which they particularly like, then we discuss possibilities of the design. This is where the objects create themselves in my mind. Usually the client sees the best elements of the design and comes up with ideas which have potential for my learning, developing and creating a new approach. Once we have a design idea we are both happy with, then pricing is calculated, and if necessary, adjustments are made to the clients wishes. Pricing and working out a lead time are the part I find most difficult, but I don't fear it, as that is the reward! Things invariably take longer than planned, however that is the nature of the work. Often I have to ask clients for more time than initially calculated, especially on big projects, as I cannot compromise on the quality of the work because of not having enough time to do the piece justice. Each piece must be given the time and energy it asks for. What do you enjoy doing apart from designing and making silverware? Meditation - I practise a form of Raja Yoga called Sahaj Marg - 'The Natural or Simple Way'. This adds depth to my creative process and also gives me a great satisfaction and fulfilment in life. I think silver 'cools' us like water.